Drinks giant Diageo says its new Roseisle whisky distillery near Burghead, in Moray, is on target to be completed by late this year. The group plans to commission the £40million plant in January and be operating at full capacity by the spring. However, it will be a while before the public will be able to sample a blend containing Roseisle malt – the first whisky will not be available until 2012. It was at the start of last year that Diageo revealed it wanted to build the new distillery to feed demand for Scotch whisky in fast-growing markets such as China. It will be Scotland’s first major new whisky distillery in 30 years. Roseisle is part of a £100million investment by the company, which will create up to 200 new jobs and boost capacity at its Scottish sites. Diageo has reported sustained and significant growth in whisky sales, which led to production capacity being increased significantly at many of its 27 existing malt distilleries. 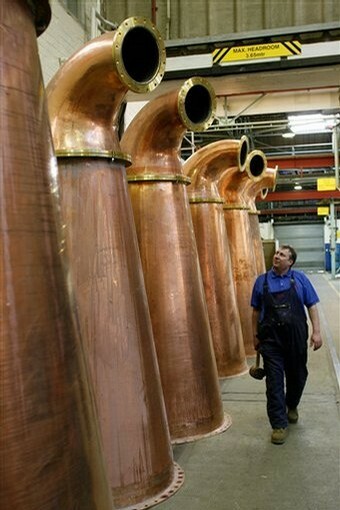 The new facility at Roseisle will be Diageo’s largest malt distillery by some way and it will be able to make 10 million litres of whisky annually, whereas the output for the current number one – Dufftown – is less than six million. Whisky from the new facility will also be up to 15% cheaper to produce than at Dufftown due to its size and because it will be a modern plant. However, there are no plans yet for a Roseisle single malt. Its output will go into popular whiskies such as 12-year-old Johnnie Walker Black Label. However, Roseisle will not be confined to producing just one distinct style of spirit. Speyside has two broad malt groups – one lighter and the other heavier – and the new distillery will produce both, with volumes dependent on Diageo’s requirements. Roseisle – which will create up to 25 jobs when it becomes operational – is being constructed by Rok in a £11.5million contract. The project will use 1,000 tonnes of steel and 1,000 tonnes of concrete. Diageo is proud that Roseisle is to be as carbon-neutral and water-neutral as possible. There was another boost for the whisky industry at the start of July when it emerged that distilleries in Tain and Islay are poised to benefit from a total £45million investment to boost production of single malts by Scotch whisky firm Glenmorangie. Expansion is being fuelled by rocketing sales of premium single malts in fast-growing markets such as Asia, continental Europe and the US. Also last month, Edrington Group – the firm behind whisky brands such as The Famous Grouse, Cutty Sark, The Macallan and Highland Park – delivered an upbeat outlook, despite soaring production costs. Discuss this story in the forums.